Heat the oven to 400°F. Stir the potatoes, sour cream, cheese, onions, chives and garlic powder in a medium bowl. Sprinkle the flour on the work surface. Unfold the pastry sheet on the work surface. Roll the pastry sheet into a 12-inch square. Cut into 36 (2-inch) squares. Press the pastry squares into 36 (1 1/2-inch) mini muffin-pan cups. Spoon about 1 tablespoon potato mixture into each tartlet shell. Sprinkle with additional crushed French fried onions, if desired. Bake for 15 minutes or until the pastries are golden brown. Let the pastries cool in the pans on wire racks for 10 minutes. Flavor Variation: For Loaded Baked Potato Puffs, omit the onions and garlic powder. Do not stir the chives into the potato mixture. Stir 3 strips bacon, cooked, drained and chopped into the potato mixture. 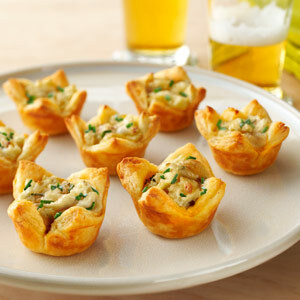 Spoon the potato mixture into the pastry cups and bake as directed above. Let cool and sprinkle with the chives. When cutting Puff Pastry, the sharper the knife or pastry cutter, the better. A dull edge can cement layers together and prevent pastry from rising. Make sure the edges of your Puff Pastry are cut - a folded edge will not rise and puff. 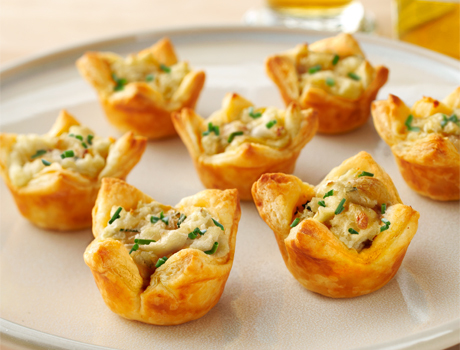 Place Puff Pastry in the muffin pan cups before adding toppings or fillings. That way, you won’t have to transfer the dough with the extra weight and risk tearing it.